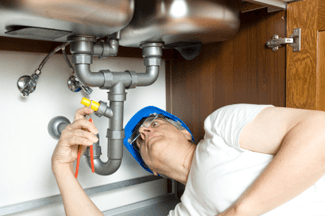 Although there are some plumbing problems that you may be able to handle on your own, some are more serious and require the immediate services of a qualified master plumber. We call these problems plumbing emergencies because they come about suddenly and can cause a lot of damage in a short amount of time. Even worse, if left untreated, they can cost you hundreds or thousands of dollars. There are many different types of plumbing emergencies that you may encounter in your home or business. Below are just some of the more common plumbing emergencies. No matter how new your pipes are or what condition you think they’re in, pipe bursting is always a possibility. When a pipe bursts, you will notice excessive amounts of leaked water and other plumbing problems. If left unfixed, the burst pipe can do permanent damage to your plumbing system. Preferred Plumbing Solutions can spot and quickly fix your burst pipe, thus preventing further damage. Clogged drains are a common—and annoying—problem for home and business owners as they prevent water from going through the drain properly. Your drain may become clogged due to food, hair or something else that has gone down the drain. If left unfixed, a clogged drain can become worse overtime and may become totally plugged up. Preferred Plumbing Solutions can determine what is causing your clogged drain and use our special tools to fix the problem. There are two things that you depend on and they’re both located in your bathroom: your toilet and your shower. If either one of these stops functioning, you will have a major plumbing emergency on your hands. Common toilet and shower issues include leaks and clogging. At Preferred Plumbing solutions, we can quickly identify a solution to your toilet or shower problem. And if your toilet or shower requires replacement, you can rest easy in the knowledge that we can order replacement parts and install your new toilet or shower fast. If you’ve noticed a bad smell in your house, it’s possible that a plumbing problem is the cause of the smell. Because there are many different plumbing causes of a bad smell, it can be hard for the average home or business owner to detect the source of the smell; however, Preferred Plumbing Solutions master plumbers are trained to determine the exact cause of a bad smell as well as how to fix it. We can get your bad smell fixed and your house will smell much better afterwards. A minor leak in your house might not seem like a big deal; however, it can really add up over time. Take, for instance, this statistic: a faucet that has a leak or is allowed to drip can waste up to 20,075 litres of water per year. Not to mention, a small leak can soon turn into a big leak, which can cause permanent damage to your house. Preferred Plumbing Solutions can determine the cause of a leak as well as correctly repair the leak. Whether you’re dealing with a small or a big leak, Preferred Plumbing Solutions is ready to help. Need Help for a Plumbing Emergency Today? Give Preferred Plumbing Solutions a call at 877-541-9033 and we’ll take care of your plumbing emergency.